For years cyclists have been lamenting the loss of the simple box section rim in a shiny silver polished finish. They were available here and there but you really had to scour local swap meets, eBay and Craigslist. If you did find them they were usually used, and in varying ranges of condition, mostly poor to fair at best and required a careful and very experienced builder to get them close to true. Well, no more of that. Velo Orange has worked for months with one of the premier rim companies in Taiwan. We researched different widths, shapes, and materials, and what was being currently sold. It quickly became apparent that we needed to offer an alloy doublewall rim. Doublewall construction adds a bit of weight as compared to singlewall (or open box) rims, but we feel a classic doublewall box design is far superior in terms of overall strength, load capacity, and impact resistance. The PBP rims in house weigh around 450g. The 19mm outside width and 13.2mm inside width is ideal for tires up to 32mm. We paid a little more for stainless eyelets and a lot more for a high polish finish. 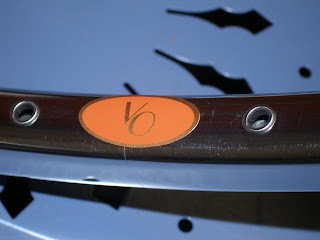 We kept the graphics down to an absolute minimum; there is a simple VO sticker for identity. The 700c PBP rim is offered in 36 and 32 hole versions. For wheelbuilders, ERD is 606mm. The price is $50 (not $40 as we initially thought; sorry). Since Chris is on vacation, questions in the comments may not be answered for a long time. UPDATE: After reviewing all the costs we realized that the price of these rims has to be $50, more than we initially thought, but still pretty reasonable. Chris says he was simply looking at the wrong column in one of Tom's infamous (and yard wide) spreadsheets. VO will be in slow mode for the next two weeks. 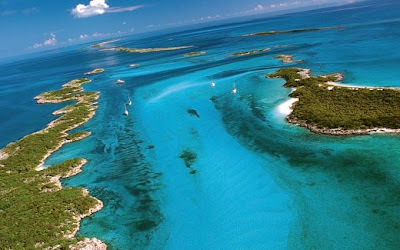 Annette and I are off to the Exuma islands for 12 days of R&R. Heidi is finishing up a sailboat race. Tom alone will be dealing with all the e-mails. Please give him a break and save the non-urgent mail until I return. Orders may ship a day later than normal. If you're planning to visit the showroom, please call ahead because Tom is the only one there to show you around. The rest of the staff will be hurriedly packing orders. 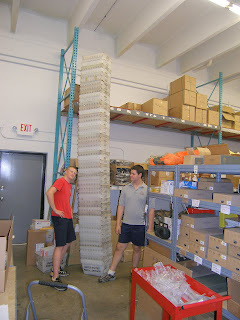 Trygve packs orders, helps manage inventory, and is our new web guy. In his spare time he's put together the new VO Info site. I had long wanted a place to post instructions for VO products, a list of VO dealers, and a few helpful articles from this blog. I think Trygve has made a great start on this! I guess I should ask what other information you'd like to see there. But remember that I'm not Sheldon Brown and don't have his encyclopedic knowledge of all things bike related. So be reasonable. By the way, Trygve's long commute to work is often on a beat low-end moutain bike. Sam is a cat-3 bike racer who's recently been finishing in the top ten in local races. Heidi is only a casual cyclist. All her spare time is devoted to racing her 33 foot sloop and she is not even remotely casual about that. I know because I've crewed for her a couple of times. The main differences from the photo are that the color will be dark gray and there will be an extended head tube. It will be available in four sizes initally, 51 x 54cm, 54 x 56cm, 57 x 59cm, and 60 x 61cm. 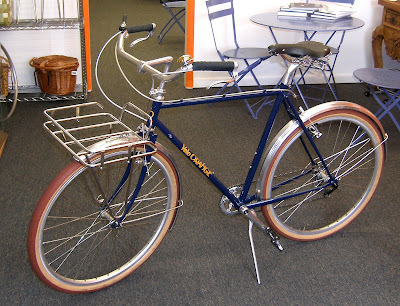 Remember that it's designed for city bars so the top tube is longer than on a rando frame. We'll add more sizes on the next run. The introductory price for the frame and fork will be $400, plus shipping. That price will go up on subsequent production runs. I recently mentioned a new threadless BB design I saw in Taiwan. Much to my surprise a sample arrived today. Usually development on products like this takes a very long time, so I wasn't expecting to get one for many months. This BB uses a new locking system that works even if the threads in the BB shell are damaged, or non-existent. That means it should fit Swiss and other oddly threaded bikes. As the adjustable cup is tightened the silver sleeve is pushed up the tapered outside face, expanding and locking in the BB. Installation requires a traditional-style BB spanner or a pin wrench. We're going to try it on a few frames before ordering, but the quality looks great. The bearing are big sealed cartridges with serious weather seals. The body and cup are alloy with nice machining. 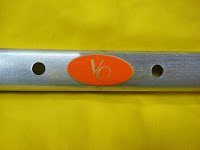 The axle is chromo steel, but not hollow. As for the colors, we can have that changed; maybe lime green? If all goes well we should see these arrive in about 3 months. The first shipment will probably be 107mm, 110mm, and 113mm lengths. We don't have final pricing yet, but I would guess they will run around $75. A lot of folks seem interested in our plans for wheels and rims, so I thought I'd write a little update. The first VO rim we'll be getting is a highly polished 20mm wide closed box section that looks a bit like the old Mavic MA2. It's a true double wall rim with nickel-plated brass eyelets The recommended tire size is 23-32mm tires. This should be the perfect rim for our upcoming rando frame. Weight will be around 450g. We have ordered them in both 32h and 36h. Pricing is not yet set, but we're trying to keep it under $40. These rims have already been made and polished and are now getting eyelets and stickers. We should have them here around the end of the month. They will initially be available individually through the VO Store and through other fine shops. Later we'll offer wheels built with them. The second rim will our new 650b rim. It's also a mirror polished, but a triple closed box section that looks a little like the CR18 we now sell. Other specs are: 24.5mm wide, 36h only, a little over 500g, nickel-plated brass eyelets. We've mounted various 650b tires on these and they are perfectly sized. Again, the price we're aiming for is under $40. If folks like these we can also have them made in 700c. This is a very strong rim that could be used for loaded touring. These rims are expected in October. It's been a time consuming project to find the best place to have new our wheels built. These rims come from Taiwan so our first idea was to have them built up in Taiwan. There are several high quality wheel building operations there and the per-wheel build cost is very attractive. But wheels are bulky and in shipping them across the Pacific we would be shipping a lot of air. It turned out not to be much more expensive to have them built here so that's what we'll do. As with our other wheels they will be hand built and hand trued. 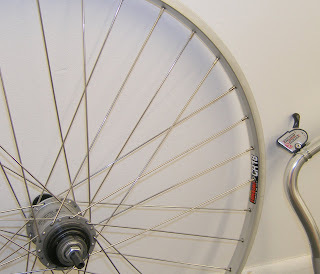 We plan to offer the PBP rims laced to Shimano 105 hubs and to a dynamo hub. The Diagonal rims will go on similar wheel sets, plus a 3-speed wheel. 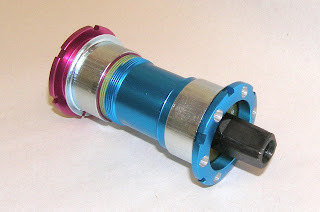 We are again considering making VO hubs, but does the world need another high-end cassette hub? The photo is of our new rim sticker, but not our rim. I have to admit that despite offering 8-speed internal-gear wheels, I think that many people would be perfectly satisfied with a less expensive 3-speed hub. Most cities in the US are just not that hilly making those 3-gears sufficient for many utility and city bikes. Of course if you live in San Francisco or have a long commute, you'll want the wider range of an 8-speed hub. We just got our new 3-speed wheels. They have Sturmey Archer AW hubs laced to CR18 rims with stainless steel 14 gauge spokes. As with our other wheels they are hand built and hand trued. The AW hub is the classic model that's been used on millions of European city bikes. In most places, that are not desperately hilly, the range and 3 gears of the the AW are sufficient for a utility/city bike. The spacing is 126mm, but you can add spacers since the axle length is 175mm. More complete specifications and details can be found here. The shifter is the cute little thumb shifter found on all those vintage English roadsters. It's made for 22.2mm bars, but will fit on road bar-sized 23.8mm bars too. Shifter cable, axle nuts, and related hardware are also included. The price is $120. On a somewhat related topic, this op-ed from the New York Times may interest those of you who, like me, are interested in car free communities. Imagine car free neighborhoods in the very cradle of the US auto industry. ALSO, Shimano 105/CR-18 wheels and wheel sets are back in stock. 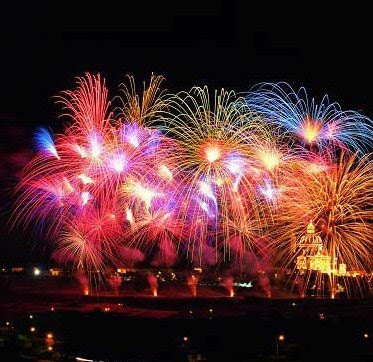 We're closing Friday, July 3rd, for our Independence Day holiday. Years ago I used to ride down to the Mall in Washington DC to watch the fireworks with a bunch of fellow cyclists each 4th of July. We used to lay in grass and, discreetly, drink beer while the fireworks exploded almost directly above us. Great fun! Now with terrorism hysteria and heightened security I'm not sure that's even possible. These days we take a ride in the country and then just walk to the waterfront at the end of our street to watch the explosions over Annapolis. 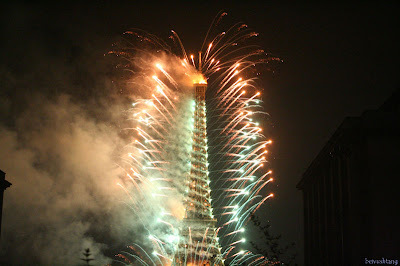 My 9-year old son and his friends love fireworks, as I used to. But lately I've found them a little too martial and jingoistic. On the other hand, my son's swim team is in the Annapolis town parade and there is a neighborhood kid's bike parade that's always a hoot. Anyone doing any cool bike related stuff? Several people have asked why VO stems are lighter than some others. The reason is that VO stems are cold forged. Many other stems, even some that cost considerably more, are "melt forged"or die cast. These less expensive process requires more metal, and weight, to archive adequate strength. The New York Times health blog, called Well, has a fascinating piece entitled, Is Bicycling Bad for Your Bones? It appears that competitive cyclist lose bone mass at an alarming rate. In 2006, Aaron Smathers, then 29, was a graduate student in the Department of Health and Exercise Science at the University of Oklahoma, gathering data for a study of brittle bones in cyclists. One of his subjects was himself, since he’s been a bike racer for years. A recent scan had revealed that his bones were less dense than usual for a man his age. Not long after those results came in, he crashed during a race, snapping his collarbone. We are getting a small shipment of MKS products next week so some of the half clips and other thing we're out of should be back in stock. A larger shipment with more items is due in a few weeks. We're working on a new site that will have PDF and HTML versions of all our product instruction sheets as well as informational articles adapted from the VO Blog and detailed frame specs. It should go live very soon.